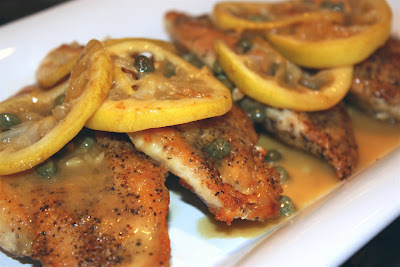 Attempting to improve on making Chicken Piccata may seem like a silly effort in that it is a fairly simple dish already... with just a few ingredients and nothing more exotic than a smattering of capers...but I think its simplicity may be the very thing that has eluded me. I suppose its standing as a "classic" -- like Chicken Marsala, Veal Scallopini, Beef (or Boeuf) Bourguignon, etc...-- makes me feel like there must be a tried and true method that ensures success. Until now, however, my Chicken Piccata experiences have kind of reminded me of the story of Goldilocks and The Three Bears. I've made it without the benefit of a proven recipe... and it was good. I've made it from published recipes (by well-respected chefs)... and they, too, were good. But I've always felt that, like Goldilocks, "this picatta is too lemony" or "this piccata is too bland." Then I came across the most recent issue of Cook's Illustrated and I think they've worked out (as they are known to do) the small little tweaks that I believe do the trick in overcoming the pitfalls I've previously experienced. While my photography skills are a definite work-in-progress, this piccata turned out beautiful (and truly delicious). Thin your chicken breasts by cutting them in half horizontally (kind of like you do a bagel), so that you have two breast-shaped pieces from each boneless, skinless breast. Unlike some methods where you pound the cutlets with a meat mallet to get super thinned cuts, this slicing of the cutlets allows you to retain the shape of the breast while still getting a "thin enough" portion (1/2 inch thickness or less). And it also allows you to get a number of them in your skillet without having to do numerous batches for servings of four or more. 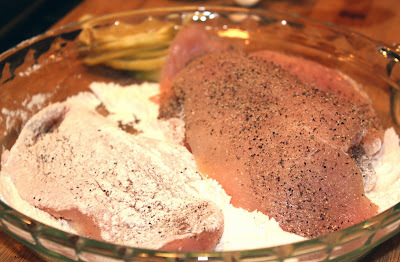 Season your thoroughly dried cutlets generously with both salt and pepper BEFORE you lightly dredge them in flour. While this might seem obvious, I've added the seasonings directly to my flour to expedite this step (as I've seen pros do as well) and you just don't get the same element of flavor. And you can run the risk of using too much flour (which isn't good) in trying to get your chicken well seasoned. By generously seasoning the cutlets prior to dredging, they really get the benefit of the salt and pepper. Once seasoned, you can lay the cutlets in your dish with flour and easily just dredge them and drop them into your skillet. And... no egg dredging necessary. As pointed out by Cook's Illustrated, why get a great battered crust going only to douse it with sauce? It will just turn mushy. Preheat your oven to 200 degrees Fahrenheit to allow you a warm oven to pop your cutlets into while you prep your sauce and/or finish up additional batches. I've made the mistake of working my sauce with the cutlets still in the skillet or removing them to a plate, and covering them with foil to keep warm, and neither are good choices for obvious reasons: you can't get the sauce right with the chicken hanging around, and you can definitely goo-up your cutlets by wrapping them while still warm. 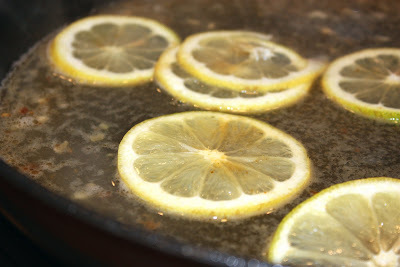 Adding lemon slices to your broth at the outset makes all the difference in getting it lemony without being acidic. Many piccata recipes call for more lemon juice than this version which may seem reasonable but, in reality, it can just add to the acidity of the dish without really enhancing the flavor. And it seems like when you add the juice in too early you end up feeling like you need more of it to keep the lemon flavor from going flat. Dropping in lemon slices at the start of your sauce prep allows the rind to soften up and flavor the sauce without adding too much tartness. Then...adding the fresh squeezed juice at the end allows you to get that great pop of fresh lemon without having to use too much. Brilliant! 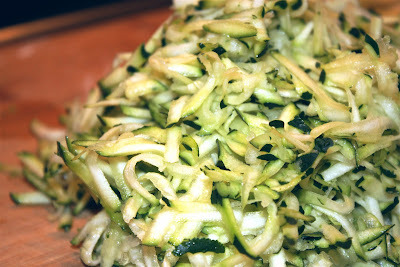 I sometimes serve this dish with garlic mashed potatoes but when I want something lighter I go with this Grated Zucchini Saute. 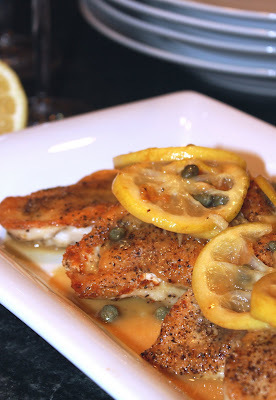 It pairs really well with the lemon flavor of the piccata. While you might think this veggie will turn out mushy, it really doesn't. It cooks so quickly it simply doesn't have a chance to. You simply grate your zucchini on the larger-hole portion of your grater and pop it all into a skillet with a little melted butter and some olive oil. Season it with salt, pepper, and some garlic powder, to taste, and you are done. It literally takes just minutes!! It's truly delicious (and healthy) and I think it makes a nice presentation for your chicken (or fish) to set upon. About six small to medium size zucchinis will make enough for four. 2. Prep your cutlets by generously seasoning them on both sides with salt and pepper. Place your flour in a shallow dish and your seasoned cutlets on top of flour. Set aside. 3. Heat 2 tablespoons olive oil in a skillet over medium high heat. Using tongs, lightly dredge your cutlets with flour on both sides, one by one, and place them in the skillet. Saute the cutlets, without moving them, for approximately 2 to 3 minutes. At about 2 minutes check to see if the first side is nicely browned. If so, turn them over and brown the other sides. Again...for another 2 to 3 minutes. Remove pan from heat and place cutlets on an oven-safe dish. Put cutlets in oven to keep warm while you cook up additional batches or start your sauce. 4. Add remaining 2 tablespoons olive oil to same skillet (DO NOT wash it out) and return it to the stove over medium heat. Add garlic and saute until fragrant (about 30 seconds)...being careful not to burn it. Add broth, wine (optional) and lemon slices. Increase heat to high and scrape skillet with a wooden spoon to loosen browned bits from cutlets. Simmer until liquid is reduced to about 1/3 cup. Add lemon juice and capers and simmer until the sauce reduces again to about 1/3 cup. Remove pan from heat. Add butter and mix in until melted. Add parsley (if desired). Spoon sauce over chicken and serve immediately. 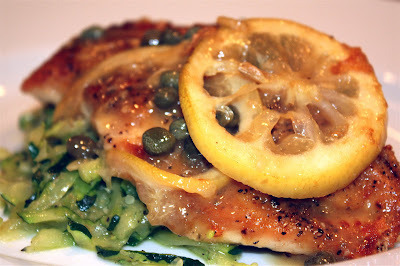 If you are serving your chicken over the Grated Zucchini Saute (see above copy for preparation), then simply spoon a bed of zucchini in the center of your plate and top with chicken piccata and then sauce.